Today the village of Cramond marks the effective western edge of Edinburgh along the line of its River Forth frontage. Two millennia ago it was part of a frontier of a very different kind, and the important Roman fort whose traces can be seen on the ground here played a role in successive attempts by the Roman empire to extend its influence to cover the whole of these islands. 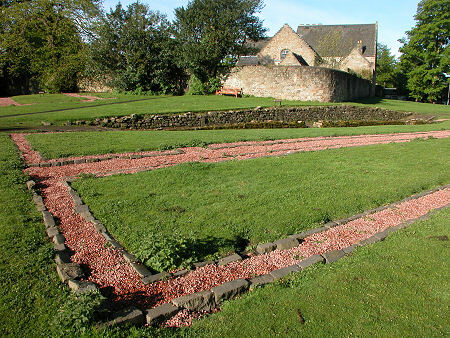 The precise story of Cramond Roman Fort, and our knowledge of its role and extent, is evolving over time as more and more work is undertaken on the ground. As a result, a visitor in 2003 would have found on display a plan of a relatively modest, typically playing-card shaped, Roman fort measuring some 175yds by 200yds, with the site of a native village mentioned to is east. In 2010 the updated signage and information board was showing a fort which was far longer along its north south axis, making it perhaps twice as large as previously thought. It was additionally showing a large walled civilian settlement to the south and east of the fort, and harbour facilities along the shore of the River Forth and the River Almond, which flows into the Forth here. In part the differences of interpretation may have been due to the fort being developed and redeveloped as Roman influence and ambition ebbed and flowed in Scotland. A fort was first built here between AD140 and AD142 during the campaigns of the Emperor Antonius Pius. 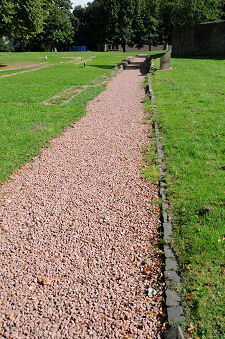 These concluded with the building of the Antonine Wall from AD142 to AD144. Located some distance to the east of the end of the wall, Cramond Fort would have been well placed to guard the harbour offered by the mouth of the River Almond and supplement the defences offered by the wall itself. This first fort appears to correspond closely with the small "standard" fort described above. The fort ceased to be used in about AD170, when the Romans retreated to establish the more easily defended line of Hadrian's Wall. In AD208 the Roman Emperor Septimius Severus led the last major Roman incursion into Scotland, and the existing Roman fort at Cramond was re-established and significantly enlarged, with a large walled settlement emerging to the south and east. During Septimius Severus's Scottish adventure Cramond served as the main supply base for the Roman forces in Scotland, and the harbour facilities would have been busy unloading food and military supplies from vessels which had sailed from southern Britain and the Rhine. The Severan incursion into Scotland was so brief you have to wonder how much of the plan for Cramond Fort and settlement ever actually became reality. Septimius Severus died in York in 211. The following year one of his sons, Caracalla (having murdered the other, Geta) succeeded Severus, and ordered the withdrawal of Roman forces back to Hadrian's wall. They would never come north in force again. The buildings of the fort and settlement appear to have remained in use by the local population for several centuries, and part of the site of the fort's was chosen for the first Christian church in Cramond in about 600. Detailed knowledge of Cramond Fort only began to emerge following excavations in the 1950s, and there have been further excavations and non-invasive surveys of parts of the site at fairly regular intervals since. 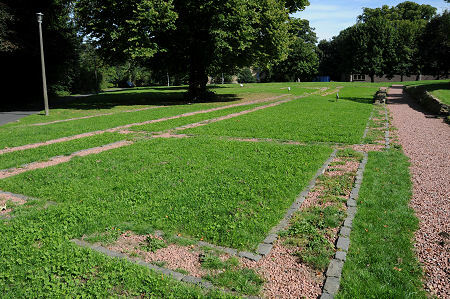 The ground plan of part of the core of the fort is laid out in an area of open parkland which wraps around the south and east sides of Cramond kirkyard. Here you can see the lines of the walls of barracks and granaries. 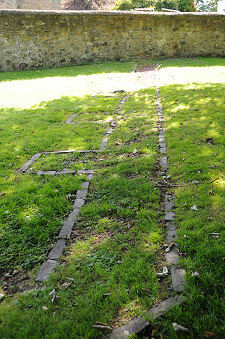 Further evidence of the fort can be found immediately to the south of the main visitor car park in Cramond. Here, if the season and density of vegetation permits, it is just possible to work out the excavated remains of one of the best preserved Roman bath houses in Scotland. This was discovered during the building of the car park in 1975 and excavated the following year. Further evidence of the Romans at Cramond was found in 1997 when a large carved stone lioness was recovered from the mouth of the River Almond.